No sooner had we gotten the images of the new Vendor and Faction stocks than we started to wonder which weapons to purchase first. With the addition of new perks, and lots of questions about how they function and how they’ll fare, we’re well aware that many of you have been wondering the same thing. In this review we’ll attempt to outline our top picks for May 19th. Be sure to also check out our “best buys before they’re gone” guide – a list of the best pre-HoW weapons. Keep in mind that every one of these weapons is “Reforge Ready,” which is to say that, assuming you like the base stats, you can spend Motes until you get a variant you’re happy with. Right now, we’re concerned with what’s going to be practical out of the box, so take our reviews with the caveat that you can always Reforge! This Void Shotgun is sporting two new House of Wolves perks, and they’re interesting enough that we think this could be a fun Shotgun to try out. The first is Battle Runner, which grants a boost to the sprint’s top speed. We’ve yet to see this one in action, so we can’t confirm how drastic it is, but this is an excellent perk in theory for a Shotgun. You land a kill, use your new speedy pace to close the distance to another enemy, and rinse and repeat. Its second perk is Graverobber, another wild card at the moment. Depending on the proc rate, this could be stellar for both ammo conservation and effective Mag Size. If it’s around 30%, this Shotgun would be ideal for at least PvE; if it’s even higher than it’ll be seen a lot in PvP. However, if it’s 20% or lower, we’d probably hold off on recommending it. Unfortunately, the Hard Luck Charm doesn’t seem to have a way to increase its base Range – despite its great base stats – and the Void damage is easily the worst for PvE. Still, keep an eye on this one. Another Crucible weapon with two new perks, this Hand Cannon could be a worthy purchase on day one. The first is Army of One, a super-charged version of Grenadier that also works on your melee, providing you can get the kill unassisted. Fortunately, for Hand Cannons this is usually a trivial matter on T1 or T2 enemies, as a single headshot will usually do them in. The second perk is Hot Swap, which grants a brief boost to initial accuracy as you ready the weapon. For Hand Cannons, which have recently been nerf’d to reduce initial accuracy, this could be an excellent way to guarantee those early hits, and thus is nicely synergistic with Army of One. It looks like it has a similar RoF/Impact to Word of Crota, which is a well-rounded class for damage and fire rate. It also has Smallbore, a new third-row perk, that increases both Range & Stability at the cost of Reload Speed and an unspecified reduction to Magazine Size. As Up the Ante has a healthy 12 to start, it could probably sponge one, or even two rounds and still be viable. It could make for a great precision weapon, and earns a recommendation from us early. Low Down P-XIV is standard Pre-HoW fare, and at best will just be another For the People or Up For Anything. Pax Totalus has a pretty middling Blast Radius in addition to no tracking in exchange for Army of One/Final Round; there are better solar launchers. Zero Point LOTP could work for you, but Third Eye and Triple Tap aren’t revolutionary for a weapon that thrives at a distance and has plenty of ammo to go around. Subtle Nudge has the new perk Hidden Hand to help with target acquisition, but is a low impact model and has no Field Scout to compensate. The new Vanguard Pulse Rifle has an impressive base stat profile that is proven to be both PvP and PvE-effective. It also sports Hidden Hand, which gives it excellent target acquisition. This offsets perfectly the penalty from its new third-row perk Casket Mag, which boosts its Magazine Size in exchange for a reduction in Accuracy. Finally, it also has Graverobber, which could (given an appropriate proc rate) encourage an in-your-face style of play to keep that giant Casket Mag frequently full. Because of this excellent potential synergy, and Pulse Rifles being a very strong option, this one should be on the top of your list. Legendary MIDA replacement. No, seriously. Outlaw remedies its middling magazine size, while Battle Runner could make it a mobile killing machine, depending on how potent and how long-lasting the buff is. Its fast base fire rate looks at a glance to be the exact same as the MIDA and previously Dead Orbit-exclusive Crypt Dweller, which lets it hammer it rounds home at a serious pace. Explosive Rounds works well with this fire rate, though not terribly well with Outlaw, or you could opt for Smallbore for a little more Range and Stability, at the cost of an admittedly precious round in the small magazine. Still, if you’ve wanted to try a faster-firing Scout Rifle, this could be your baby. Pest Control Matrix looks like it could be a great purchase – if they ever buff Auto Rifles again. Otherwise, it’s just sitting as a living testament to how overboard the nerf went, as it is a return to the Shadow Price/Grim Citizen RoF/Impact class. Give/Take Equation is almost a carbon copy of Plug One.1, which means it’s a great Fusion Rifle, but nothing really new. Amplified Geo-D6 has disappointing Void damage, but hey, if you need a Shoot to Loot weapon then this one is your best bet. Finally available for purchase, we’d be crazy not to point this Hand Cannon out. It seems like its entire perkset is geared toward making a deadly accurate firearm even more accurate. Hidden Hand grants that crazy target acquisition, while Triple Tap (copy of Phantom Gift) rewards you for your precision with an extra round per three consecutive headshots. Take it one step further with Rifled Barrel, for more Range at the cost of Reload Speed, or patch Reload Speed instead with Speed Reload. The Red Hand’s base Stability already makes it a must-have for HC or New Monarchy enthusiasts, and this stock set of perks amplify all its strengths. 10 in the Mag is fine by itself, but can be theoreticalyl boosted to 14 if you manage to land an entire magazine of headshots. Take some Hand Cannon gauntlets or Chain of Woe on your Gunslinger and you’ll be set. It’s not a revolutionary launcher by any means, but it has all the right stuff to be a great buy for those who are still looking for an Arc Heavy. Despite its low velocity, the near-perfect Blast Radius ensures maximum AoE devastation. Tracking is understood to be a necessity on Rocket Launchers these days, and Spray & Play perfectly mitigates the pitiful one-rocket Magazine Size of the Admonisher. It even stacks with Flared Magwell, so you’ll barely even notice the reloading handicap. You might even get a second shot off before your first hits its target! Vindicator XI is another uninspired Auto Rifle with a low Magazine Size that isn’t worth your time. Judgment VI is more-or-less the same as the Hard Luck Charm, but with a critical two less in the mag, in addition to a slower fire rate that makes it ill-fitted for PvE. 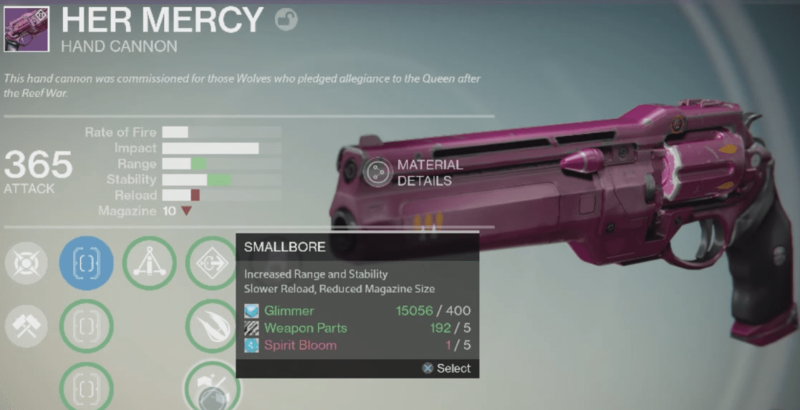 Yes you can increase its Range with Smallbore, but you reduce its Magazine Size to a hilariously low 3 if you do. Pacifier X is an ideal base stat model, but only has 33 in the mag, and two Pre-HoW perks that you probably already have on your go-to LMG. We predict Pre-HoW LMGs with Field Scout to be prized, as the perk seems to have been removed entirely from the Vendors. Violator XII sniper has the very interesting “Replenish” ability, but is outclassed by many common Solar variants, with an insufficient 4 in the mag and only Mulligan to set itself apart. Now this is a Shotgun. 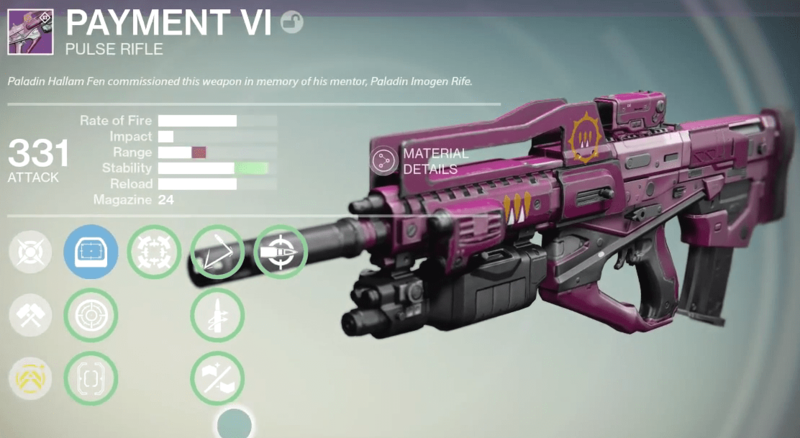 It has a healthy base RoF and Impact, which is highly prized for PvE, and can be deadly in the right hands in PvP. Battle Runner and Rangefinder may be the perk combo to beat, being flawlessly suited to what a Shotgun is made for. You’ll be able to sprint quickly to your next target and safely take them out while ADS from a frustrating distance. Its base Range is somewhat poor, but this can be remedied with Accurized Ballistics, at the cost of stability. 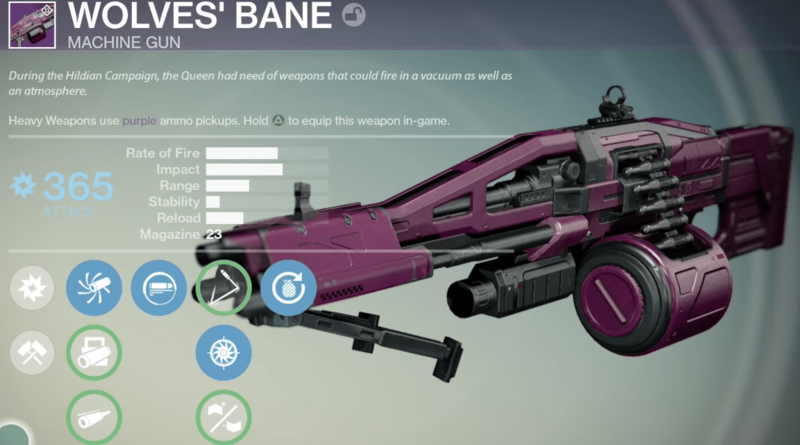 The Rude Awakening also has Reinforced Barrel, which may yet turn out to be the Hammer Forged of House of Wolves. This well-balanced Shotgun also has 6 in the mag, so if you’re a Dead Orbit fanatic, this should be at the top of your short-list for weapons to buy. Tripod and Grenades and Horseshoes? Dead Orbit is killing it, pun intended. It also happens to be the slightly-more-rare Void damage, which will be great news for those of you who’ve been looking for a Void launcher for Nightfalls. With Admonisher III from New Monarchy, the Exodus Plan RS/1 from Dead Orbit, and the Hunger of Crota from Crota’s End, you’ll be set with three very respectable Legendaries that cover the whole rainbow of elemental damage. RS/1’s has a great balanced mix of Blast Radius, Velocity, and Reload Speed, the final of which can and should be buffed with Flared Magwell, so you can load your next three rounds of death that much faster. Consider this as a replacement for your Truth, exchanging the admittedly very useful advanced tracking for the ability to free up your Exotic slot. Yes, Dead Orbit gets three mentions. The Luna here looks really fun. It has Army of One, the previously mentioned perk that rewards the lone wolf for undiscriminating lethality. It also has a fire rate that is on-par with the rare B-Line Trauma – a breath of fresh air for a class that seems to really enjoy the VoC/Fang of Ir Yût/Saterienne Rapier RoF/Impact class. What makes it really exciting is Full Auto, which lets it take advantage of its absurd fire rate and effectively act as a superbly-damaging Auto Rifle. The base Stability is discouraging because of its RoF/Full Auto, and unfortunately there’s no listed perks yet that can help shore up this stat. However, if you can master its recoil, you might find the Deadshot Luna SR1 to be just the Scout you’re looking for. Unwilling Soul is a joke, requiring perfect perks to beat its god-awful Stability. We’ll never recommend it with Auto Rifles in their current state. Arma Engine DOA has a desirable base stat profile, but with an astoundingly low Magazine Size for its RoF, and obviously no Field Scout to take the edge off of it. Final Rest sports the potentially gimmicky-fun Icarus, but is otherwise the same gun you’ve always known it to be. It’s not a bad buy though, with Arc damage, Reinforced Barrel, and Spray & Play being nice, if not wholly novel selling points. This Void fusion rifle is aptly named. Its stats and perks are fine-tuned around the idea that firing quickly and constantly is a strategy for victory. Its Charge Rate is already monstrous, coming at the understandable cost of a bit of Impact. The Range is average, the Stability is average, but its Reload Speed is near-maximum. Its respectable Magazine Size of 5 can be bumped up with Enhanced Battery, or you can double down on Battle Runner by going with Lightweight. With this weapon, you should be looking to get your kills and aggressively position yourself for your next one, with Battle Runner leading the way. This will be an excellent choice for the Crucible thanks to Replenish, which will refill the entire mag whenever a Super is cast. With Enhanced Battery, a well-timed Super could lead to a theoretical 11 shots in a single magazine. 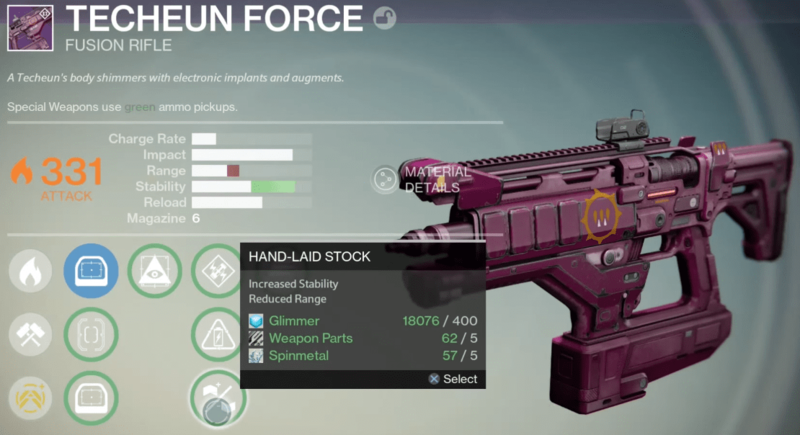 Void Damage is a little bit of a let-down in PvE, but won’t matter in the Crucible, and that’s where this gun will thrive. The Conduit needs its Casket Mag to remedy the 18 count, but then sacrifices stability, and Reactive Reload still doesn’t last long enough to be appealing. The Chosen is another mediocre Sniper with below-average perks and a low magazine count that has to compete with Black Hammer, Icebreaker, or your custom Efrideet’s for its spot in your roster or even your Vault. The Fulcrum is a poor man’s Red Hand IX, with Extended Mag needed to patch its low Magazine Size of 8, the same Hidden Hand perk, but the inferior Zen Moment instead of just very high base Stability. It’s not that you couldn’t do well with it, but you almost certainly have a better Hand Cannon by now. The Culling has the misplaced Battle Runner to add to its pedestrian perks, and nothing to help its reserve ammo, though it thankfully has 74 in the mag, at least. The Fear would be noteworthy if it weren’t for Dead Orbits identical-stat, superior Exodus Plan, which has Tripod in place of Battle Runner. There aren’t any default perksets for these weapons. They drop from every difficulty of PoE (including 28) with a random set of perks, but are Reforge Ready if you aren’t satisfied with your RNG roll. 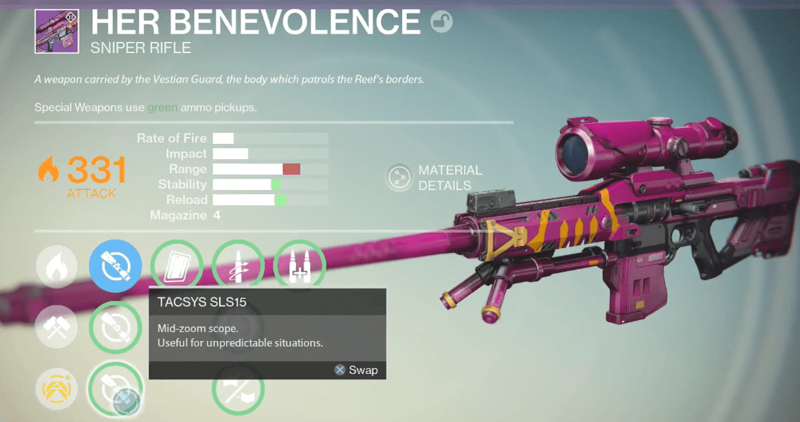 We can say that the high-impact Sniper Rifle, Her Benevolence, should be a high-priority reforge for those of you who enjoy doing massive amounts of damage with a single shot. Considering the disappointing default Snipers from the Vendors, it’s even more appealing. 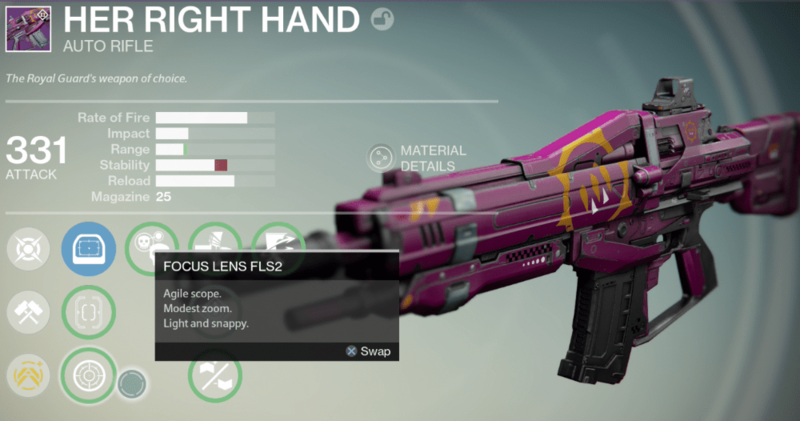 The Hand Cannon, Her Mercy, has low Range and Stability, but might be a mortal tool with the right perks. House of Wolves has wisely given Guardians the freedom to reforge its new weapons, but still has plenty of great gear to be had on day one. The weapons outlined above are just our opinions of the vendor standouts. They could easily prove to be better or worse than we anticipated, but we feel comfortable in saying that you won’t have buyer’s remorse if you pick out a couple of your favorites from our recommendations. 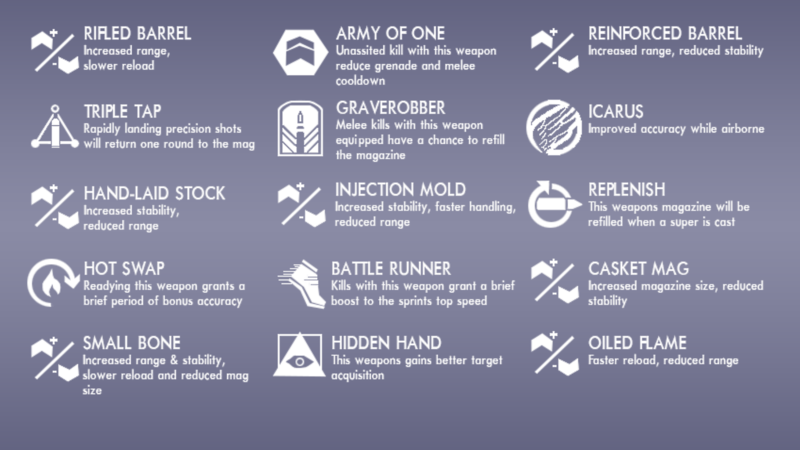 What do you think of the House of Wolves weapons? Did we overlook a diamond in the rough, or do you just want to weigh in on what kind of job Bungie did in designing them? We’d love to hear it all in the comments. Previous Post:All of the New Vendor Weapons!